"There's more than one of you," Thomas says indignantly. "What about that ugly little Gnome you've got with you?" Norman looks down at me. I shrug. I've been called worse. The icing on this particular cake of crazy is that right beside Guard Thomas is a job board with a bounty to kill ten Murlocs. In true MMO lazy-quest logic, you need to collect body parts as proof of the killing, and the body parts are not a 100% drop. The quest calls for "torn Murloc fins." Now, Murlocs are depicted as having several fins on their backs, but they never drop more than one when killed, and often they don't drop any. Where things get really stupid is that Murlocs also sometimes drop "Murloc fins", that is, not torn. The non-torn fins are used in cooking Murloc soup. You can't cook with torn fins, and the guard won't accept non-torn fins as proof of a kill. Of course, this only provokes objections from frustrated players. Why can't I turn in non-torn fins as proof? What the hell is wrong with this guard? I mean, I had to kill a Murloc to get this. Barring that, why can't I just tear these non-torn fins myself? Why do Murlocs have five fins each but often drop none at all? Why can't I make soup from torn fins? It's SOUP! And why am I throwing away this great big carcass and making soup from just a single fin, anyway? What possible flavor or nutrition can there be in a fin? And so on. It's fractal nonsense: If you examine any aspect of the quest, you'll find it's just as absurd as the whole, and filled with other, smaller absurdities, all the way down. I realize this is how a lot of MMO games work, but laziness like this is easy to correct. Have the bounty objects be spears, or heads, or necklaces, or some other non-edible type object. There. Done. Make the ingredient for Murloc soup be a leg, or a bit of meat, or whatever. 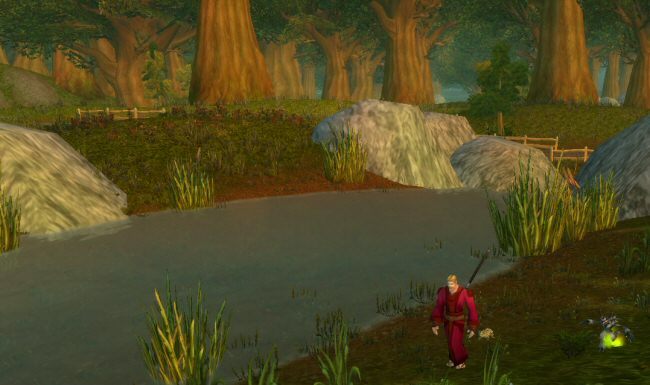 I don't think WoW needs to be some complex simulation, and I'm prepared to swallow all sorts of absurd contrivances for the sake of fun gameplay, but it's like the author went out of their way to make something that can't possibly make sense and will punish you for reading quest text and attempting to enjoy the flavor of the world. This flavor text is spiked with stupidity. This is especially noticeable since most of the rest of the world was re-worked for Cataclysm to fix exactly these sorts of quests, and I think this one is new. One final note: What is the deal with Murlocs in this game? 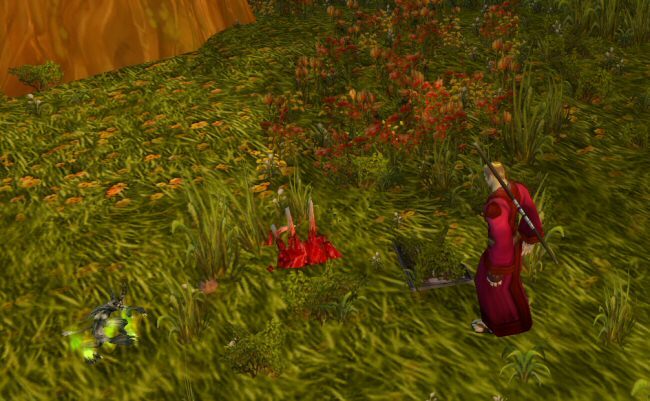 Pre-Cataclysm, Murlocs were the bane of my questing experience. 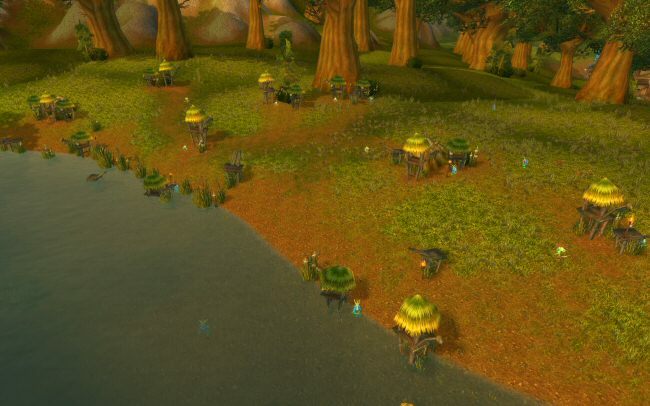 In Westfall (the next questing area after the forest we're in now) there was a recipe that called for Murloc eyes. The drop rate on the eyes was insulting. I remember wiping out an entire village of Murlocs and finding not a single eyeball among them. That quest has now been completely fixed, but I still carry the scars. Someone at Blizzard apparently really loves their Murlocs and hates players who hunt them. Norman and I follow the river for some distance and eventually find a few small, un-eaten morsels of Guard Malakai. "I think it's safe to say this wasn't self-inflicted," I point out. "Ugh. Even his armor is gone. Those guys must have been really hungry. Let's find the other guy. The tracks lead off to the east."